Our 2018 Hackathon is now in the books. For this year’s event, we had over 80 participants spread across 13 teams collaborating in our offices across this globe. To shake things up for our 2018 event, we directed the hacking into four categories. This concentration will help us to incorporate better the solutions developed into either our product roadmaps or our internal tools and procedures. How do we push beyond the traditional uses of the applications and utilize the latest generation/bleeding edge tech to incorporate Artificial Intelligence, Machine Learning, and Virtual Reality into our portfolio? How can we improve deployment and reduce the effort and complexity of implementation across our portfolio? As our customers expand further into digital channels and into third-party relationships as part of the IoT ecosystem, how can we better enable our applications to behave out-of-the-box for these environments? What can we do to improve the display, navigation, interaction with and understanding of with the data in our solution? By my math, over 2000 development hours were logged this week as part of the Hackathon and that time will serve as a way to kick-start new initiatives that will make enabling our solutions. 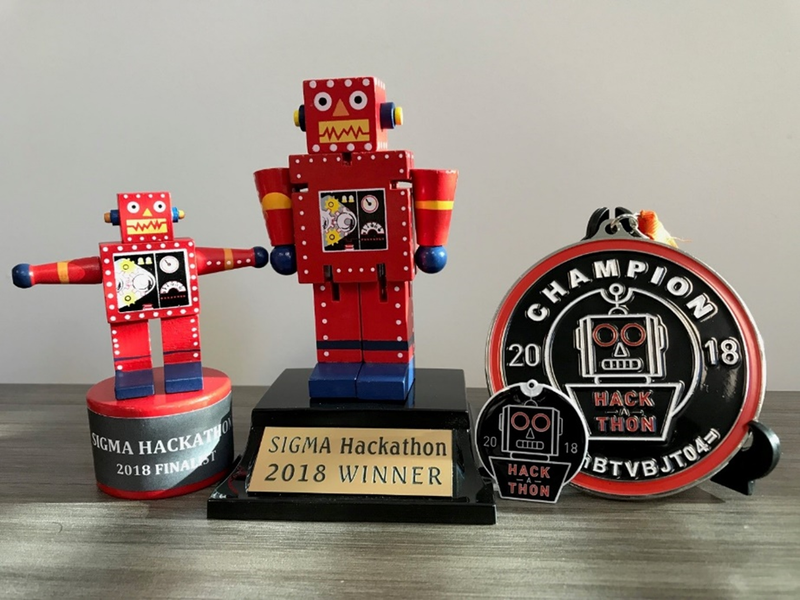 And while all these Hacakthon developments will be great for our customers, I still think the coolest thing to come out of the event was the robot-themed prizes (see pic below) for the participants. Interested in participating in our 2019 Hackathon and other cool events here? Join the Sigma team! We have almost two dozen open opportunities in various locations around the world.